Damage to homes caused by the tornado. Photo by Rogelio Serrano. Used with permission. The following extract of an article by Rogelio Serrano Pérez is published exclusively on Global Voices. The original Spanish-language version of “Las víctimas de Irma en la ciudad de los tornados” (Irma's Victims in Tornado City) can be found on Periodismo de Barrio's website. Yainelis’ eyes nearly sprang from their sockets, but her shock didn't freeze her in place. Phone in hand, she went to hunt the tornado. A few years ago she was close to two waterspouts, and in 2008 Hurricane Ike threw her and her family into a wall as they battled to save their apartment door. 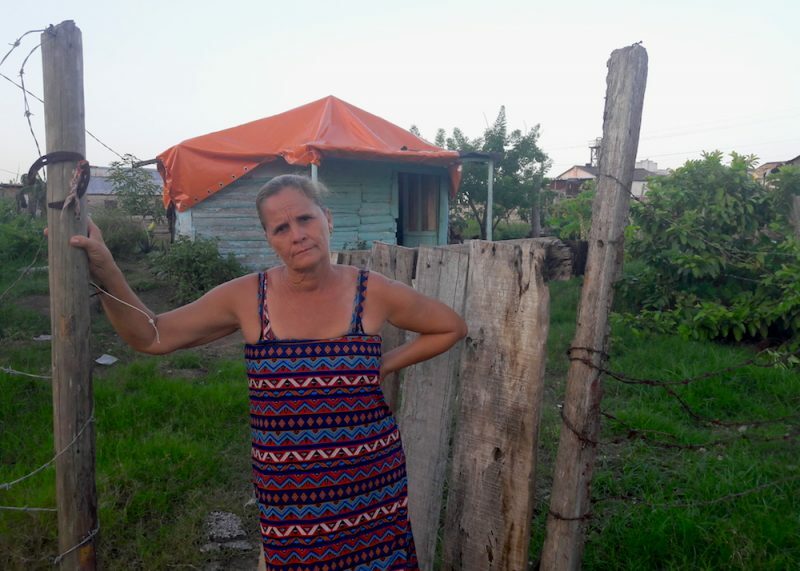 For Yainelis, however, the tornado that cut a path of destruction in the central Cuban city of Camagüey on 29 August 2017 was the most striking. ¡Menos mal que está deshabitada! Los trabajadores de la Empresa Eléctrica trabajaron hasta la madrugada para bajarlo del tendido eléctrico. Thank goodness there was no one there! Electricians were working into the early hours to get it down from the power lines. The historic quarter was taken by surprise by the tornado, but there no one was unprepared for Hurricane Irma, the extremely powerful storm that would barrel through the Caribbean several days later. Hurricanes are familiar on the island; tornados, not so much. Los tornados en Cuba no se pronostican. El especialista puede tener la convicción de que todas las condiciones son propicias para que ese día ocurra un tornado, pero no existen suficientes elementos para localizar el lugar donde va a ocurrir”. Al haber un tornado debe hacerse un estudio del recorrido, analizando todo tipo de daño y recibiendo información de todos aquellos que lo vieron desarrollarse. Ahora no se pudo hacer, y es cada vez más difícil. Cuba's tornadoes are never predicted. An expert can be certain that all the conditions are right for a tornado that day, but there's never enough data to identify where it will take place. When there is a tornado a study should be made of its path, analysing every kind of damage and collecting information from anyone who saw it develop. This wasn't possible this time, and it's becoming more and more difficult. “We have made advances in the use of radars, but the Institute isn't carrying out a study into tornadoes. I have been almost entirely dedicated to climate change since 1995, and I was the only one to investigate the tornadoes in Camagüey,” Roger Rivero explains. Not a single media outlet releases warnings to prepare the locals for tornadoes. “It's different with hurricanes; we're warned, but tornadoes form in minutes,” says Idalia Andreu. Nobody from the government came to these people's homes to ask about the damage caused by the tornado. Now, if José wanted to get back the tiles that the tornado took away, he could claim that they were destroyed by Irma. The tornado's toll, according to the figure offered up by Televisión Camagüey to national news outlets, was 20 residences and the recently renovated Guiñol Theatre. The disgraceful situation of the residents of the Nuevo Venezuela area, near the canned foods factory El Mambí, was similarly ignored by the news reports. The Nuevo Venezuela area is new and has sidewalks, paved streets and stone houses. Many people squat illegally between the city limits and the central railway lines. “This area isn't on the maps.” Pedro Luis Hernández Martínez's words hit home. He's new here, and is living here illegally like the rest. “If I don't buy the tiles myself no one is going to give me anything. I've lost 300 pesos just on tiles. Irma caused even more damage to his house and doubled the number of holes in the roof. Rolando and his wife are now making do with pieces of nylon to shelter their six-month-old son from the leaks. The tornado was enough to make Ramón Reynier Almanza Díaz seek refuge in relatives’ houses when they found out about Irma. For those who saw it on TV, the tornado was sad, curious, brief and faraway. The news channels didn't come to talk to those whose children are traumatised, like Ramón. Now, everything is the same: the media never stops talking about the impact of Hurricane Irma and the rescue efforts made by the people and the government. No one says anything about those who were left to their fate, like Rolando and his children. For them, Irma will always be the peak of the most turbulent time in their lives, which started on 29 August in Tornado City.